This is our family’s second time through third grade, and I can honestly say it just gets better every time. We are, of course, using the Christopherus curriculum. It is such a joyful way to move through this year of “doing” and practical work. We are beginning our year with studying Native American culture and legends. My third grader has been looking forward to this block since even before he started first grade! Something about the culture seems to resonate strongly with him. He was born in Oklahoma, so perhaps he carried something of the strong pulse of the Native American culture with him from his birthplace. There is even rumor through the family grapevine that a great-great-great-grandmother was a Native American princess. He loves to hear this story and consider the possibility. 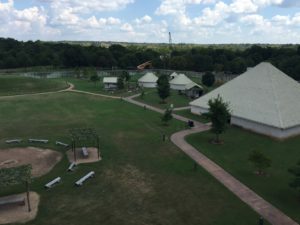 We began celebrating our Native American focus by visiting the Chickasaw National Recreation Area and Cultural Center in Sulphur, OK. We have been there before, but it never grows old. As soon as you step onto the grounds of the cultural center, it is easy to feel transported by the e nergy of the place. I instantly feel grounded and gifted just to have the experience. 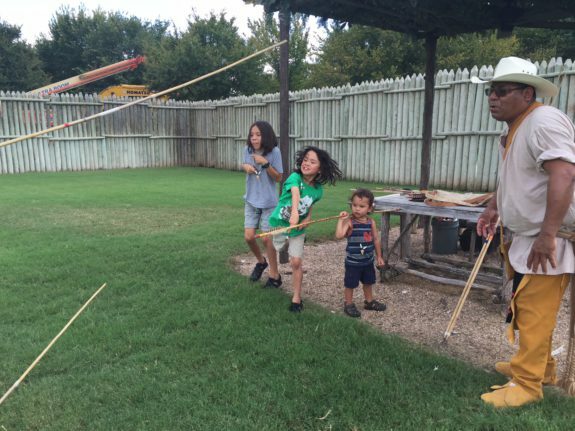 They have a full-scale model of a Chickasaw village, as well as activities such as a stomp dance, archery, chunky (a fun game involving a rolling stone and spears for throwing), and stick ball (a traditional game similar to lacrosse). The beginning of our block will open with our study of the Native Americans of the Woodlands. I will give an introduction based on the vivid picture Donna paints of the Woodland people. We will also read a legend called The Heron and the Hummingbird that comes from this culture. We will cover the Native American people by region, usually taking about a week or a week and a half to cover each particular region. We are also delving heavily into practical work during this block by building our own tipi in the backyard. I will have to assist during this project, but have high hopes of my third-grader being able to do much of the work himself. I will try to capture a few pictures of this process. I will say that gathering materials was beginning to seem a bit daunting in regard to the poles we needed. I wanted to use a natural material, but finding something long enough and straight enough became an issue. Finally, I realized we have a local source for the perfect material! Bamboo! It will not be a traditional material for a tipi, but it will be used, I believe, in the same spirit. It is renewable and local. I was able to procure 10-12’ poles from a man growing it in his backyard only about twenty miles from us. We were able to watch him harvest it and give us an education on how it grows and even about the tiny little bats that love to make the bamboo their home. We will not make the outer cover from animal skins, but will use a canvas drop cloth cut to the needed shape. I know that this project will be enjoyable not only for my third grader but for the whole family! We will also have a couple of other field trips geared toward this block. There is a local Pow Wow that takes place every year, and we hope to be able to attend. It does fall on my third grader’s birthday weekend, so we will have to see how that goes! 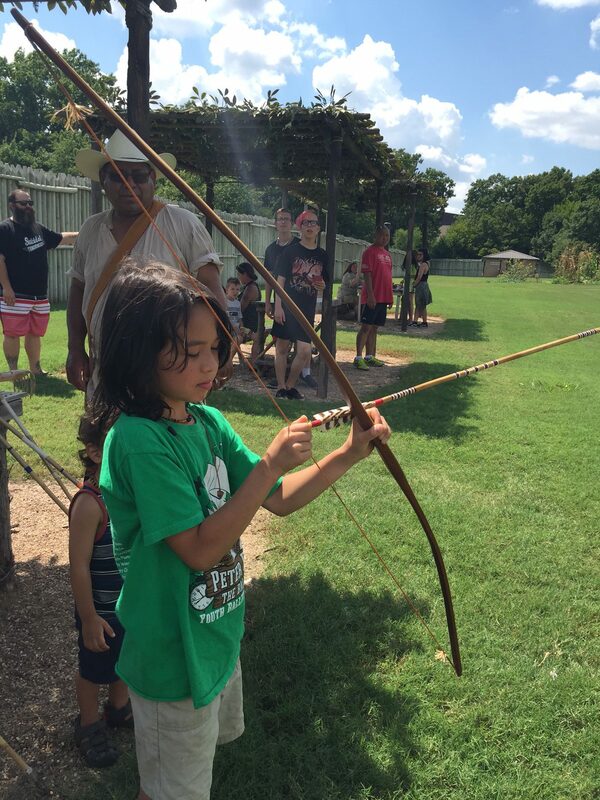 We also have a day camp planned with a local wilderness camp that does a Native American focus, covering foraging for food, traditional hunting, and fishing, tipis as housing, storytelling, sign language, native songs and dance. I think I am as excited (or more so) about this day camp as my children! 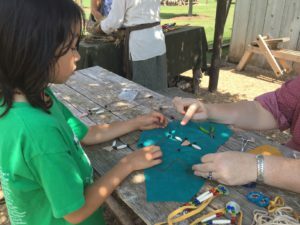 During our block, we will also try our hand at a few crafts such as a dreamcatcher, moccasins and making a couple of dioramas based on the traditional housing of each culture we study. We will also do a bit of cooking, as we make a Three Sisters Soup for our Tuesday night soup meal. 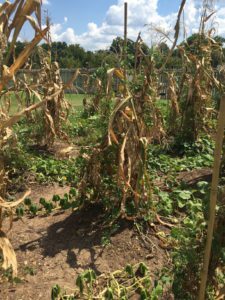 We started our own Three Sisters garden this month, as we have a long fall season here. However, we have a huge challenge with rabbits and pill bugs and squash bugs here, so we will have to see if our garden will be able to overcome these obstacles. We attempted this garden during my older son’s third-grade year with no success. We are starting our plants in peat pots this time and will see if it helps to plant them when they are out of the seedling stage. We may also utilize some chicken wire. The practical work of our third-grade year is organically woven in throughout the year, as needs arise. Which means, even during our Native American block, we will being doing work on our chicken tractor and chicken coop for our growing chicks that we hatched this summer. I like to think of each homeschool year as a celebration with a different theme. Keeping our work joyful is often a challenge, but the intention often makes the difference between homeschool as a drudgery or something to look forward to. Right now I have two children who are very excited to start their homeschool adventures for the year. I will work to cultivate this enthusiasm as we start on this year’s journey.